The code for this chapter is in probability.py. For information about downloading and working with this code, see Section 0.2. Another way to represent a distribution is a probability mass function (PMF), which maps from each value to its probability. A probability is a frequency expressed as a fraction of the sample size, n. To get from frequencies to probabilities, we divide through by n, which is called normalization. The Pmf is normalized so total probability is 1. Pmf and Hist objects are similar in many ways; in fact, they inherit many of their methods from a common parent class. For example, the methods Values and Items work the same way for both. The biggest difference is that a Hist maps from values to integer counters; a Pmf maps from values to floating-point probabilities. Pmf objects provide a Copy method so you can make and modify a copy without affecting the original. My notation in this section might seem inconsistent, but there is a system: I use Pmf for the name of the class, pmf for an instance of the class, and PMF for the mathematical concept of a probability mass function. To plot a Pmf as a bar graph, you can use thinkplot.Hist. Bar graphs are most useful if the number of values in the Pmf is small. To plot a Pmf as a step function, you can use thinkplot.Pmf. This option is most useful if there are a large number of values and the Pmf is smooth. This function also works with Hist objects. In addition, pyplot provides a function called hist that takes a sequence of values, computes a histogram, and plots it. Since I use Hist objects, I usually don’t use pyplot.hist. Figure 3.1: PMF of pregnancy lengths for first babies and others, using bar graphs and step functions. Figure 3.1 shows PMFs of pregnancy length for first babies and others using bar graphs (left) and step functions (right). By plotting the PMF instead of the histogram, we can compare the two distributions without being mislead by the difference in sample size. Based on this figure, first babies seem to be less likely than others to arrive on time (week 39) and more likely to be a late (weeks 41 and 42). PrePlot takes optional parameters rows and cols to make a grid of figures, in this case one row of two figures. The first figure (on the left) displays the Pmfs using thinkplot.Hist, as we have seen before. The second call to PrePlot resets the color generator. Then SubPlot switches to the second figure (on the right) and displays the Pmfs using thinkplot.Pmfs. I used the axis option to ensure that the two figures are on the same axes, which is generally a good idea if you intend to compare two figures. 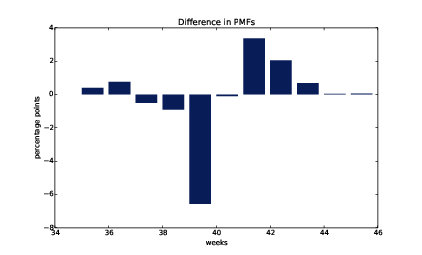 In this code, weeks is the range of weeks; diffs is the difference between the two PMFs in percentage points. Figure 3.2 shows the result as a bar chart. This figure makes the pattern clearer: first babies are less likely to be born in week 39, and somewhat more likely to be born in weeks 41 and 42. 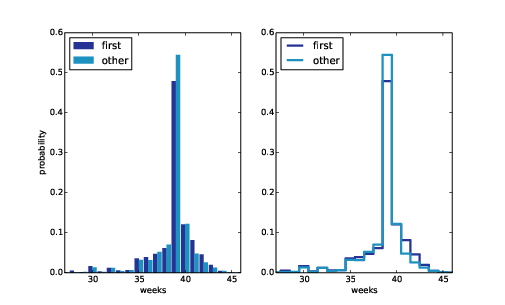 Figure 3.2: Difference, in percentage points, by week. For now we should hold this conclusion only tentatively. We used the same dataset to identify an apparent difference and then chose a visualization that makes the difference apparent. We can’t be sure this effect is real; it might be due to random variation. We’ll address this concern later. The number of students who enjoy a small class is small, but the number of students in a large class is (ahem!) large. First, I compute the distribution as observed by students, where the probability associated with each class size is “biased” by the number of students in the class. For each class size, x, we multiply the probability by x, the number of students who observe that class size. The result is a new Pmf that represents the biased distribution. Figure 3.3: Distribution of class sizes, actual and as observed by students. Figure 3.3 shows the result. 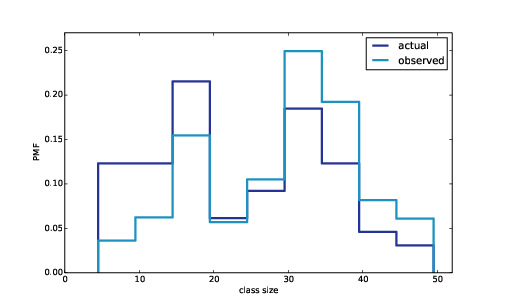 In the biased distribution there are fewer small classes and more large ones. The mean of the biased distribution is 29.1, almost 25% higher than the actual mean. It is also possible to invert this operation. Suppose you want to find the distribution of class sizes at a college, but you can’t get reliable data from the Dean. An alternative is to choose a random sample of students and ask how many students are in their classes. It’s similar to BiasPmf; the only difference is that it divides each probability by x instead of multiplying. You can also provide row names. The set of row names is called the index; the row names themselves are called labels. If you know the integer position of a row, rather than its label, you can use the iloc attribute, which also returns a Series. loc can also take a list of labels; in that case, the result is a DataFrame. The result in either case is a DataFrame, but notice that the first result includes the end of the slice; the second doesn’t. My advice: if your rows have labels that are not simple integers, use the labels consistently and avoid using integer positions. Exercise 1 Something like the class size paradox appears if you survey children and ask how many children are in their family. Families with many children are more likely to appear in your sample, and families with no children have no chance to be in the sample. Use the NSFG respondent variable NUMKDHH to construct the actual distribution for the number of children under 18 in the household. Now compute the biased distribution we would see if we surveyed the children and asked them how many children under 18 (including themselves) are in their household. Plot the actual and biased distributions, and compute their means. As a starting place, you can use chap03ex.ipynb. Write functions called PmfMean and PmfVar that take a Pmf object and compute the mean and variance. To test these methods, check that they are consistent with the methods Mean and Var provided by Pmf. Exercise 3 I started with the question, “Are first babies more likely to be late?” To address it, I computed the difference in means between groups of babies, but I ignored the possibility that there might be a difference between first babies and others for the same woman. To address this version of the question, select respondents who have at least two babies and compute pairwise differences. Does this formulation of the question yield a different result? When I ran a long-distance (209 miles) relay race for the first time, I noticed an odd phenomenon: when I overtook another runner, I was usually much faster, and when another runner overtook me, he was usually much faster. At first I thought that the distribution of speeds might be bimodal; that is, there were many slow runners and many fast runners, but few at my speed. Then I realized that I was the victim of a bias similar to the effect of class size. The race was unusual in two ways: it used a staggered start, so teams started at different times; also, many teams included runners at different levels of ability. As a result, runners were spread out along the course with little relationship between speed and location. When I joined the race, the runners near me were (pretty much) a random sample of the runners in the race. So where does the bias come from? During my time on the course, the chance of overtaking a runner, or being overtaken, is proportional to the difference in our speeds. I am more likely to catch a slow runner, and more likely to be caught by a fast runner. But runners at the same speed are unlikely to see each other. Write a function called ObservedPmf that takes a Pmf representing the actual distribution of runners’ speeds, and the speed of a running observer, and returns a new Pmf representing the distribution of runners’ speeds as seen by the observer. To test your function, you can use relay.py, which reads the results from the James Joyce Ramble 10K in Dedham MA and converts the pace of each runner to mph. Compute the distribution of speeds you would observe if you ran a relay race at 7.5 mph with this group of runners. A solution to this exercise is in relay_soln.py. Probability mass function (PMF): a representation of a distribution as a function that maps from values to probabilities. probability: A frequency expressed as a fraction of the sample size. normalization: The process of dividing a frequency by a sample size to get a probability. index: In a pandas DataFrame, the index is a special column that contains the row labels.